Custom web development is quite different from creating your website using a website builder. For most people who promote a website builder, they are usually focusing on the differences in costs. What does a web design and development firm do? A web design and development firm provides a number of services to clients apart from design and development. These other services may include search engine optimization, online marketing, social media marketing, and content creation. Web designers usually provide the design and artistic side which involve the visual look and feel of the website, and ergonomics. A web developer is similar to a programmer or someone who works on a website's functionality or how the site works. A full service web design and development firm is often competent in providing these services. But it's essential to find one that caters to small and medium enterprises since they usually charge reasonably. Finding a reputable firm makes a huge difference since their team of designers and developers are vetted and committed to their clients' needs. And of course, fast custom development is a priority for these firms especially if it's a client's business necessity. A website builder, on the other hand, is software that provides customers with a drag-and-drop user interface and hundreds of templates. 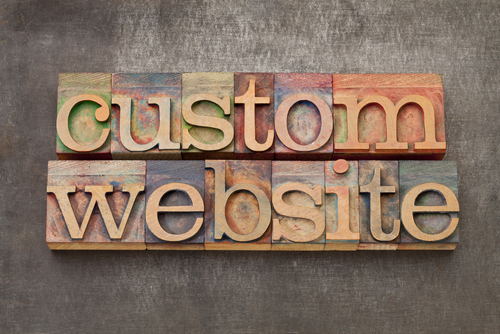 Notable website builders include Wix, SquareSpace, Weebly, Jimdo, IMCreator, and GoDaddy. Website builders require a monthly fee (starting at $4 per month) and a customer can develop his own website by using the drag-and-drop interface. They've made the learning on their software quite small, so it's easy and fast to get a website. If you need a website built for your business, it's best to take a look at the other main points that separate custom web development from website builder. Website builders usually start at $4 per month. But if you'll need to extend and add other features, you'll have to pay for them as well. Comparatively, if you'll work with an outsourced web development team, you may need to pay from $50 to $200 per hour depending on their geographic location and level of expertise. Using a website builder limits your options since the company provides the design templates. A custom web design, however, may cost you from a few hundred to over a thousand dollars if you'll hire a freelance designer/developer, and upwards (a few thousand dollars) if you'll choose a web development and design company. Website builders are usually owned by large companies, so it's often expected that they offer very limited access to customers. Comparatively, web development teams provide all accessible communication lines to customers. Many of them even have 24/7 access to online chats and phone calls to provide instant solutions to customers' problems. Website builders are known for using WYSWYG (what you see is what you get) drag-and-drop user interface. This is similar to a CMS (content management system) editor like that of WordPress. Web design and development firms may or may not offer a CMS with the website they build for you. However, many of today's firms are aware that this is a necessity since business owners may need a client-facing CMS that they can use on their own (such as for blogging, posting ads, etc.). A business website that's built by an expert web development firm is usually more scalable and extendable than one that's built by a website builder. The complexity of building a custom business website that's ready for scale and extension can only be done by an experienced firm. Website builders are usually ideal for DIY webmasters and those who create and maintain websites for their hobbies. But if you have a business that needs more features and functionalities, it's only right to choose a web development team. If you'd like to team up with an expert development and design firm, Fast Track development team can help you. Give us call today and let's discuss on building you a professional business website.